Ain't It Cool News: The best in movie, TV, DVD, and comic book news. : Moriarty from Aint It Cool News has apparently run a huge spoiler for the ending of Terminator 4, supposedly confirmed by Devin Faraci at chud.com, who warns that, "if you read it, will ruin the movie for you. And to the best of my knowledge it is 100% true." "'Alright so the main character is a cyborg named Marcus. For some background, Marcus was a criminal who was executed in 2003. He donated his body to Project Angel which was involved with SkyNet. They take his body and make a terminator out of him so he's a terminator skeleton but has living muscle/skin and a beating heart too. 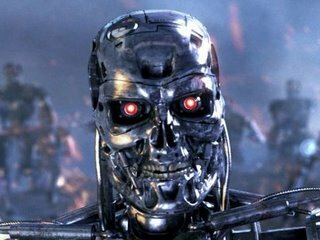 At the end of the movie John Connor is fighting a T800 model 101 and loses. He dies and the top resistance people come up with a plan to help the resistance keep fighting on. The resistance feels that it's important to keep the image or idea that John Connor is still alive so the resistance keeps going. So they rip off Marcus' skin and put John Connor's on the skeleton so now Marcus is John Connor.'" There's also news that the cyborgs are human brains inside robot bodies. A little bit of carefully orchestrated viral advertising?